Saving three days at sea by flying both ways, East Greenland’s towering icebergs, vivid displays of the Aurora Borealis and autumn tinged landscapes have never been more accessible. Highlights include exploring Scoresby Sund, the world’s largest fjord system, and the iceberg graveyard at Rodefjord - a photographer’s paradise! Your adventure begins with an overnight stay in thoroughly modern Reykjavik, the world's northernmost capital city. You'll fly from Reykjavik to Constable Point to board your vessel and begin your expedition. Get ready for a great adventure ahead! You'll cruise through breathtaking Apelfjord. Fjords punctuate the scenery all around. Your day will be spent exploring and Zodiac cruising through a multitude of dazzling icebergs, fjords and sounds in all shapes and sizes. 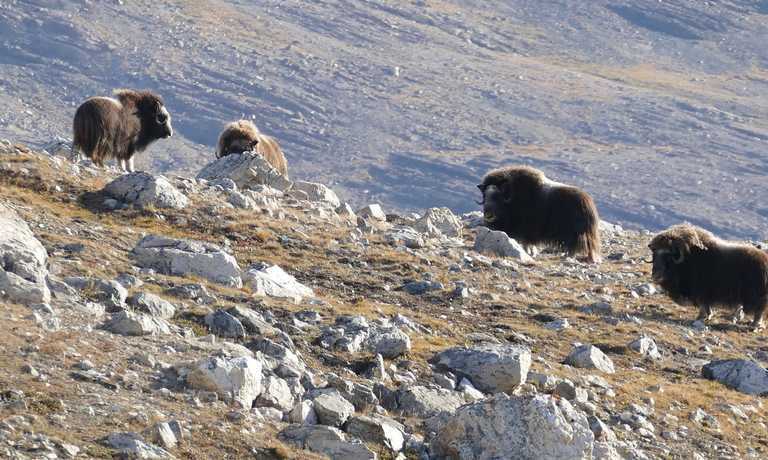 Be on the lookout for Arctic fox and musk ox, which roam free here. Multi-hued mountains surround lovely Brogetdal, which was originally called "painted valley," and later translated to mean "multicoloured valley." You'll view colourful vistas, and fascinating geology. Later, you'll travel to the impressive and rarely visited Waltershausen Glacier, an imposing ice floe at the head of Nordfjord, named after German explorer Baron Wolfgang Sartorius von Waltershausen, after his failed 1869 attempt to reach the North Pole via East Greenland. Blomsterbugten, the 'Bay of Flowers', is home to beautiful purple and gold coloured rocks that you'll view from a distance, or on a hike for those who wish. Later you'll continue to Renbugten, called 'Reindeer Bay' for the herd of 12 reindeer seen on one of the first expeditions to the area. Arctic hare are a common and delightful sight in this area. Ella Oya is a hiker's paradise. The area is surrounded by ice-choked waters, rugged cliffs and sky-blue icebergs. Challenge yourself with a climb to the top of the island, the views are worth it. 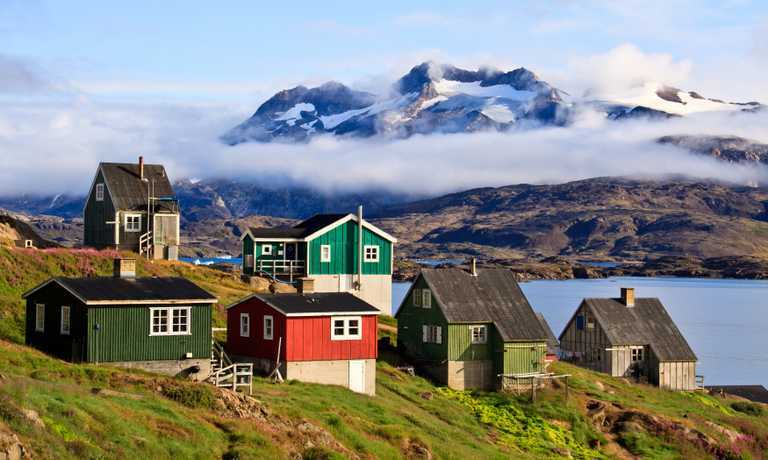 At the start of the sound, Itoqqortoormiit is East Greenland's most northerly community and boasts a blend of traditional and modern lifestyles. With clear skies, you'll have a great opportunity to see the northern lights. You can also support local Inuit artisans by purchasing unique handicrafts. Your time here is spent bonding with the Inuit people and gaining an appreciation of their way of life. Later, you'll see huge icebergs - larger than football fields, taller than apartment buildings - crossing Hall Bredning, part of Scoresby Sund. Sailing on, deeper into Scoresby Sund you'll encounter massive icebergs and an ancient Thule settlement as you approach Sydkap. The scenery here is unforgettable, with towering mountainsides and hundreds of monumental icebergs playing tricks with your sense of perception. Make your own way to the airport for your return flight home, or spend some extra time in Reykjavik - you'll be amazed at the variety of attractions and must-see places of interests Reykjavik has to offer. NOTE: This itinerary is for guidance only. 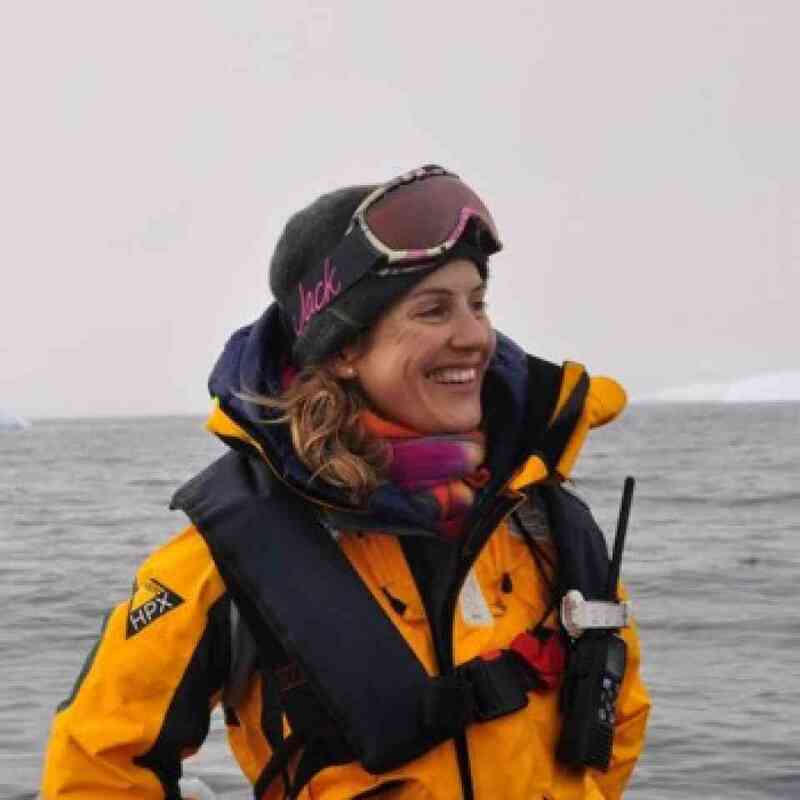 Each voyage will vary depending on ice and weather conditions, and opportunities to see wildlife. Flexibility is key and all part of the adventure of an expeditionary cruise. The very experienced crew are super friendly and make you feel at home straight away. Child Policy: At date of embarkation, the minimum age restriction of 8 years and a minimum height and weight requirement of 64 lbs or 29kg and 48" or 1.2 meters must be met.